Last night's assassination of Police Officers Wenjian Liu and Rafael Ramos was a tragedy. There is no other way to describe it. Two men simply doing their job gunned down in cold blood as they sat in their cruiser. The killer furthered his cowardly act by turning the gun on himself, escaping the responsibility of answering for his actions. Any sane individual mourns with the city of New York and the NYPD over this senseless tragedy. A moment like this should unite a city that has already seen such unrest the past few weeks. Unfortunately, pundits, politicians and others who gain from division have jumped on the opportunity to politicize this. Long Island Congressman Peter King (who has previously supported cop-killers) has used this tragedy to point the finger at people like Bill de Blasio and President Barack Obama for their "cop bashing," suggesting some kind of link between yesterday's killer and the president of the United States. The Patrolman's Benevolent Association President Pat Lynch has skipped all of the subtleties that politicians like King have woven into their statements. He directly blames Bill De Blasio, saying the New York mayor has "blood on his hands." Just to be clear: all blame for this tragedy lies with the coward who pulled the trigger. He is the only individual with blood on his hands. Not the mayor, not the peaceful protestors, and certainly not the president. To suggest otherwise is not only disingenuous, but dangerous in that it removes the onus of responsibility from the real killer and places it on people who had nothing to do with it. When Eric Garner's killer received a "no bill" from the Staten Island grand jury, thousands of New Yorkers peacefully took to the streets to protest (full disclosure: I was one of them). They weren't protesting individual officers, they weren't calling for violence against any member of the NYPD. Instead, they were calling for justice. They were asking the system to do its job and prosecute wrongdoing. They were acknowledging the sad truth that there are two different systems in this country depending on your skin color. They were not calling for retribution - violence only begets violence. Calling for reforms in how we police communities is not even in the same stratosphere as calling for violence against those who police our communities. In fact, the latter directly contradicts the former. Which is why those marching weeks ago should be just as outraged at this cold-blooded act. This heinous act was not just an attack on the NYPD, but an attack on the entire city. 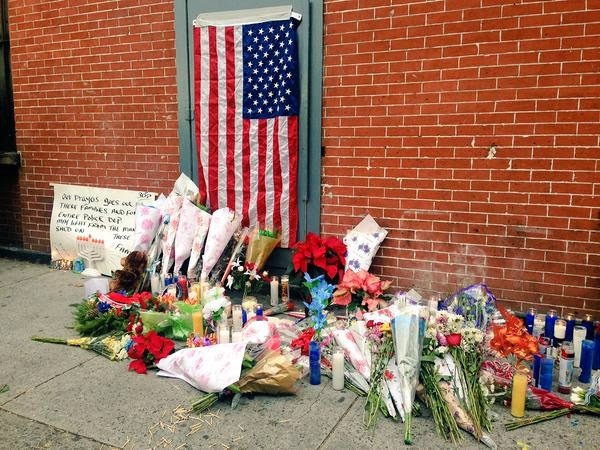 The mourning is not - and should not - be confined to the NYPD. I would urge all city residents who felt the urge to protest the past few weeks to attend tonight's 6pm candlelight vigil for Police Officers Liu and Ramos. No matter on which side of the thin blue line violences occurs - it should be loudly denounced and repudiated. I also urge people to take a step back from the rhetoric and don't buy into those people who use situations like these to score political points. The reality is that 95% of people want to find a middle ground. They want to see peace and a system that works for everybody. Those other 5% - those on either side of every issue who use peaceful protests to assault police officers or blame everyone but the actual killer after a tragedy - they thrive on these kinds of divisions. Don't let them. This is a time to come together, not apart.